Herons and Egrets and Bitterns, Oh my! The City of Chesapeake capitalized on people’s familiarity and affection for the Great Blue Heron by selecting it as the official symbol of the City in 2006. And have you ever noticed all the statues of the Great Blue at various places and business throughout the City? These are the result of the “Blue Heron Project,” a nonprofit community initiative led by a group of local volunteers seeking to sell blue heron sculptures to area businesses, individuals, and other organizations as a way to raise its goal of $1 million for education. The sculptures were designed by Myke Irving, and each is painted with its own unique design and is put up for “adoption.” Chicago has its cow statues, Norfolk has its mermaids, and Chesapeake now has its herons. 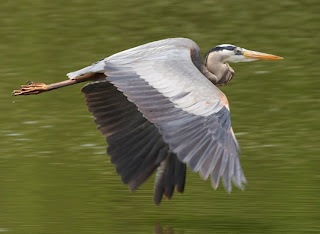 Southeastern Virginia, with its many wetlands, mild climate, and proximity to the Atlantic Coast,is attractive to a num ber of other species of large waders, including herons, their close relatives the egrets, ibis, and two species of Bitterns. Some of these are secretive and hard to find, while others can be easily spotted if you’re observant. 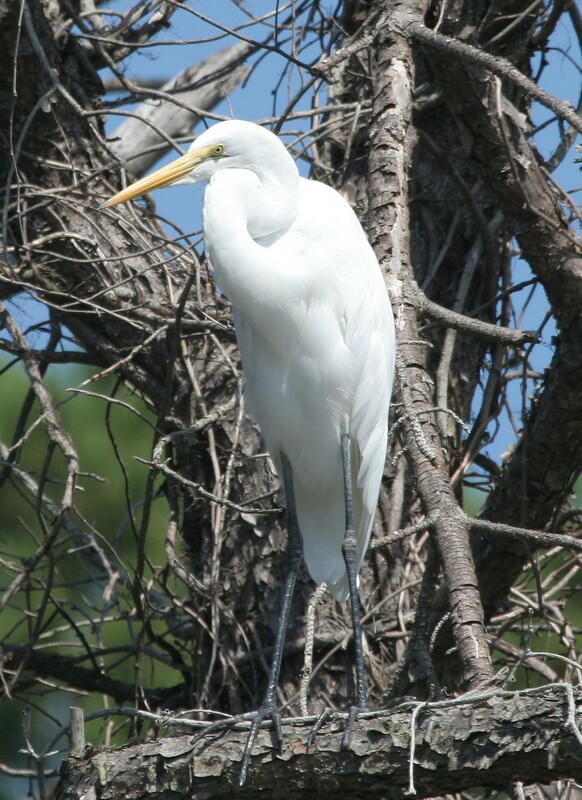 The Snowy Egret is smaller than the Great Egret, has a black bill and black legs, and startling yellow feet! The foot color is a diagnostic field mark for this egret, so if you see yellow feet there is no doubt that you’re looking at a Snowy. A very few Snowies might winter some years in our area, but for the most part they migrate to the south during the winter and return to breed in the spring and summer. 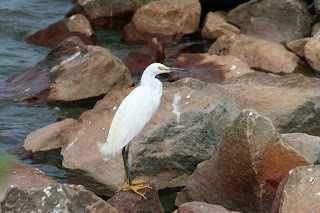 The third egret we see here is far less common than the other two, and its habits are quite different as well. The Cattle Egret is often found in the company of cattle – really! Instead of feeding with the other egrets in wetlands, it mostly feeds in relatively dry grassy habitats, often accompanying cattle or other large mammals. It is an opportunist, as it catches insects and other sources of food that are kicked up by the cattle. Cattle Egrets do not have the long necked, elegant look of the other egrets; they are stockier and have a more “hunched” posture. In breeding season, they have patches of orangish-buffy colored feathers on the breast and head. I usually see a few Cattle Egrets in Virginia each summer in fields within a mile or two of the coast, particularly near Back Bay and Chincoteague. 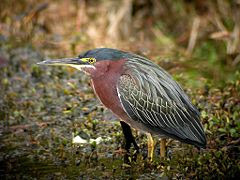 The Green Heron, above (photo courtesy of wikipedia.com) is a small heron that breeds and summers here in wet and swampy places. You’ll usually find it at the water’s edge or on a branch overhanging the water, waiting for prey. 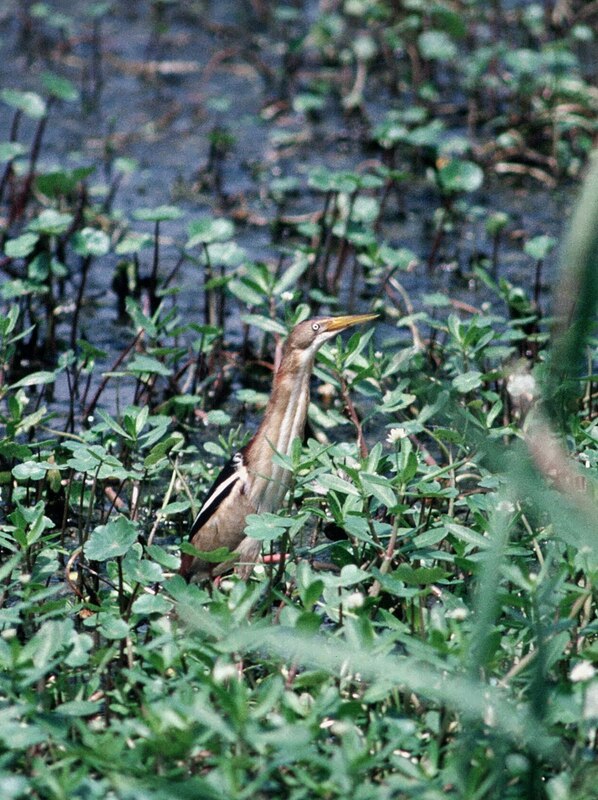 These birds have been know to drop insects and other small objects into the water to attract fish, making it one of very few animals that uses tools. 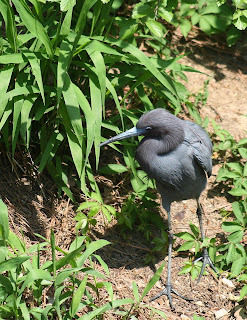 This bird above is an adult Little Blue Heron, a small heron of southeastern and subtropical swamps. Surprisingly, the young birds (photo below) are all white except for a little bit of black in the wing, and they can be confused with egrets to those who aren’t familiar with the differences. According to wikipedia.com, these young white birds mingle with Snowy Egrets, and actually catch more fish when in their company; they also gain a measure of protection from predators when in these mixed flocks. One theory is that it is because of these advantages that the Little Blues remain white for their first year. 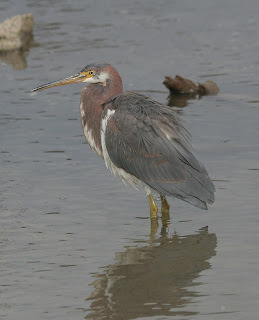 Below is one of my favorites, a Tri-colored Heron. This species used to be called the Louisiana Heron. It is a breeder in the Gulf and southeastern states only, another bird of southern and subtropical swamps. This bird is a juvenile I saw on the Eastern Shore in late summer. 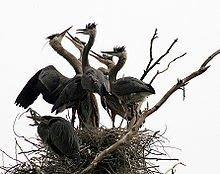 These last two herons are “night herons.” The name refers to their preference for noctural feeding, although you will see them during the day as well. 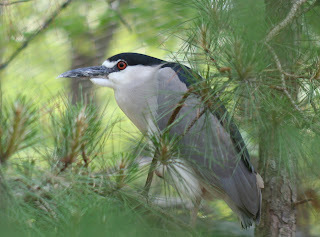 The first bird (below) is a Black-crowned Night Heron, a species that occurs throughout most of North America. 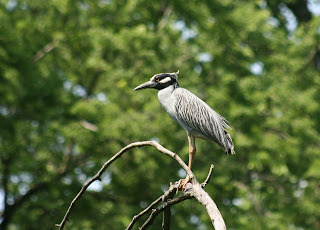 The second bird is another specialty of the southeastern states, the Yellow-crowned Night Heron. 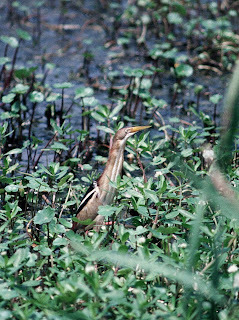 Bitterns are another classification of birds in the heron family. They tend to be short-necked, have brown streaky underparts, and have very secretive habits. They reside in the reeds and grasses in extensive mar shes; if you’re lucky enough to see one it’s usually because it happens to be feeding at the water’s edge, or it has taken flight. Even when bitterns are out in the open they are very difficult to spot because of their unique defense mechanism of “freezing” in place. They raise their heads, pointing their bills straight up at the sky, and stand motionless against the background of reeds and grasses; their own brown streaky underparts blend in perfectly with the grasses. 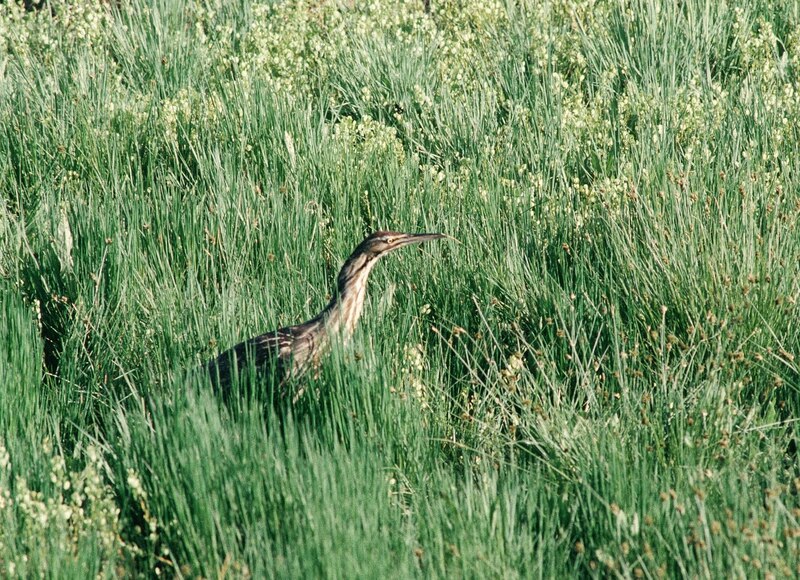 If a breeze blows the grasses, the bittern will “sway” along with the grass so it continues to blend in. Perfect camoflage! 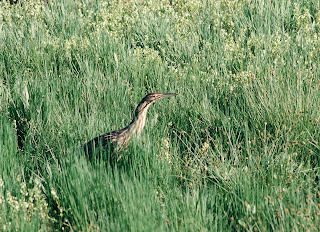 We get two species of bittern in our area, one during the winter and one during the summer. It might seem confusing at first, trying to identify the different species of large waders. Your best bet starting out is to go birding with someone who already has some experience in identifying them, and can help in pointing out the different field marks. Another good bet is to study the birding field guides before you ever go out into the field. I keep preaching this, but it’s very helpful to have a bird’s picture in your head before you see the actual bird, and understand when and where you are likely to encounter a particular bird. 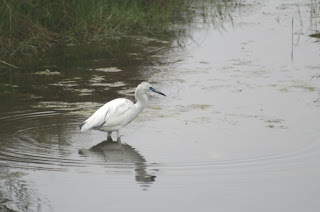 If you see a large white wader in Chesapeake, you’ll know that it’s not a Whooping Crane, because you have already learned that that species does not occur here; it is far more likely to be a Great Egret, which is quite common here. The books are invaluable in helping you to “know your birds,” but nothing can replace the experience you gain yourself out in the field. Spring is right around the corner now (at last!) and breeding birds will start arriving soon, so I encourage you to check out a bird guide at your library and head for your nearest wetland. Have a wonderful time, and always feel free to contact me if you’re perplexed about a bird you’re having trouble identifying. Not Green Enough? Don't Panic! There is a problem with trying to live “a simple life” – it’s a lot of work! That’s why in all those pictures of pioneer women, they look so worn out! There was a time (20 years ago) when I was motivated to be totally self-sustaining. I had the energy back then, you see.